Following on from last weeks ‘Best XV’ players that he had played with for both club and county, former Offaly and Edenderry footballer Declan Farrell discusses the ‘Best XV’ players he ever played against. In goals I’ve gone for Billy Morgan of Cork. He’s regarded as one of the best of all times and always in the shake up to be named on top teams. He was probably way ahead of his time in many ways. For right corner back I’ve gone for Meath’s Robbie O’Malley. He was an excellent footballer who possessed everything. He had great speed and strength. He won an All-Ireland at midfield and then full back. John O’Keefe of Kerry was an all round good footballer and very strong. A very good footballing full back. My own county man takes the left corner back slot. Cathal Daly from Tullamore possessed severe pace and his key attribute was his ability to get out in front of his marker. His record speaks for itself. I don’t need to go into details about why Paidi Ó’Sé is on my team. His record with Kerry was phenomenal and he is one the best of all time. He was a great scoring wing back. Tim Kennelly of Kerry was the old school traditional centre back. He held the middle and was a tower of strength. He could have easily been picked in the forwards but Denis ‘Ogie’ Moran of Kerry played in defence a lot too. 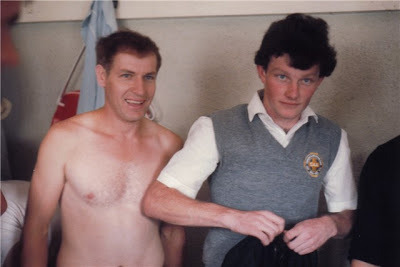 Ogie was a great footballer and he was very fast. Both of my midfielders had the same traits. Brian Mullins from Dublin was an outstanding footballer who could score, he could field the ball and he was a brilliant leader. I’d have to say the same for Jack Ó’Sé of Kerry to be fair. In fact, if people were to name the best two midfielders they ever saw I’ve no doubt these two men would be in strong contention to be on it. He has to be one of the best players to never win an All-Ireland. Kildare’s Dermot Earley was a brilliant servant. He had two great feet and he was very strong. Larry Tompkins was the difference in Cork winning two All-Irelands, he was simply that good. On his day he was as good as anyone in the country and he was a great free taker. I’d have to say Kerry’s Pat Spillane is in the top 3-4 players I ever seen never mind playing against. He was a brilliant footballer who could score from distance, he was a great worker and he was very strong. Kerry was an outstanding team but Mikey Sheehy was one of the truly outstanding footballers on that team. He was very good on the ball and he’d have to be in the shake up for been on the best team ever. Eoin Liston wasn’t just a target man, he could play and he was very strong. The Kerry players fed off him and he was excellent in his role. He was possibly Kerry’s most important player. For me Eugene McKenna of Tyrone was an absolutely brilliant footballer. He could hold his own in any company. It was such a huge loss to Tyrone when he went off injured in the 1986 All-Ireland final. Extract from the Offaly Topic.